BREAKING! SPECIAL QUEENS LITERARY CRAWL EDITION! Line Break is the eclectic live literary magazine where poetry meets prose, fact meets fiction, and high-brow meets low-brow. We are honored to be bringing our unique blend of writers and genres to the Queens Literary Crawl in Forest Hills on Thursday, April 28. The Queens Literary Crawl (which benefits the Queens Book Festival) is an amazing assemblage of more than a hundred literary luminaries all reading on various stages throughout Forest Hills on one magical night. One $9.99 ticket gets you access to it all, which includes the special Line Break stage at Aged Restaurant. No rules, no themesjust the best writers in our fair city. Line Breakit's the start of a new thought. Don't miss it! Admission $9.99. Ticketholders get access to all literary stages, not just the Line Break stage! Aged Restaurant, like all the Queens Literary Crawl venues, is near the Forest Hills/71st Ave stop on the E/F/M/R subway lines. This page contains a single entry by William Shunn published on April 22, 2016 10:52 AM. 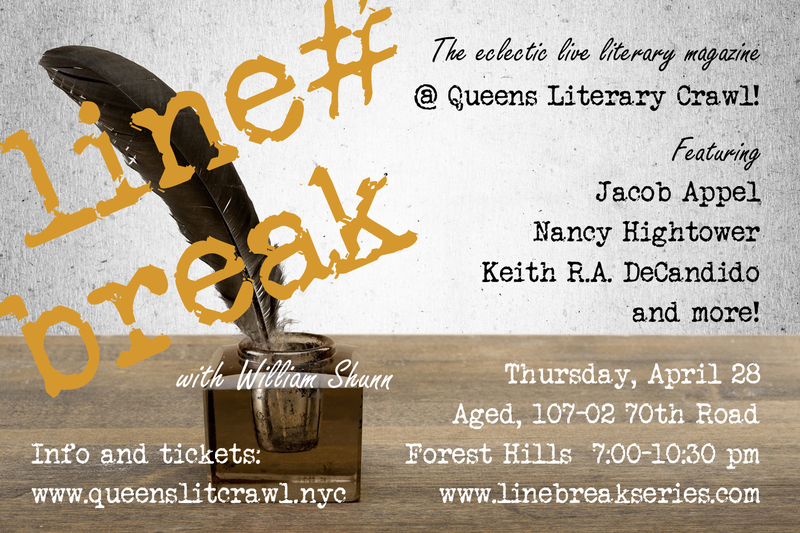 Line Break wants YOU for the Queens Literary Crawl was the previous entry in this blog. Meet our readers: Marleen S. Barr is the next entry in this blog.